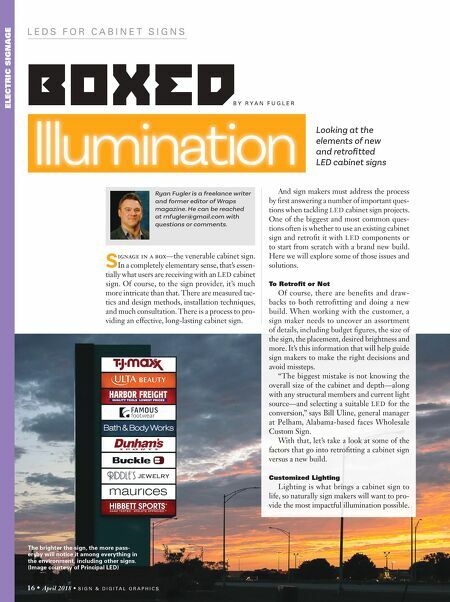 L E D S F O R C A B I N E T S I G N S lllumination Looking at the elements of new and retrofitted LED cabinet signs B Y R Y A N F U G L E R Ryan Fugler is a freelance writer and former editor of Wraps magazine. He can be reached at rnfugler@gmail.com with questions or comments. ELECTRIC SIGNAGE 16 • April 2018 • S I G N & D I G I T A L G R A P H I C S S ignage in a box—the venerable cabinet sign. In a completely elementary sense, that's essen- tially what users are receiving with an LED cabinet sign. Of course, to the sign provider, it's much more intricate than that. There are measured tac- tics and design methods, installation techniques, and much consultation. There is a process to pro- viding an effective, long-lasting cabinet sign. The brighter the sign, the more pass- ersby will notice it among everything in the environment, including other signs. (Image courtesy of Principal LED) BOXED And sign makers must address the process by first answering a number of important ques- tions when tackling LED cabinet sign projects. One of the biggest and most common ques- tions often is whether to use an existing cabinet sign and retrofit it with LED components or to start from scratch with a brand new build. Here we will explore some of those issues and solutions. To Retrofit or Not Of course, there are benefits and draw- backs to both retrofitting and doing a new build. When working with the customer, a sign maker needs to uncover an assortment of details, including budget figures, the size of the sign, the placement, desired brightness and more. It's this information that will help guide sign makers to make the right decisions and avoid missteps. 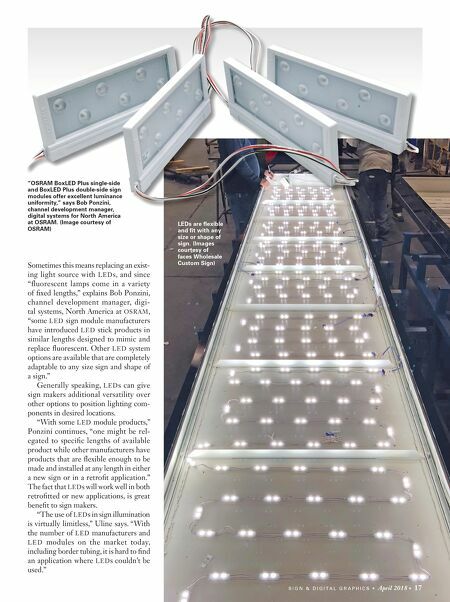 "The biggest mistake is not knowing the overall size of the cabinet and depth—along with any structural members and current light source—and selecting a suitable LED for the conversion," says Bill Uline, general manager at Pelham, Alabama-based faces Wholesale Custom Sign. With that, let's take a look at some of the factors that go into retrofitting a cabinet sign versus a new build. Customized Lighting Lighting is what brings a cabinet sign to life, so naturally sign makers will want to pro- vide the most impactful illumination possible.